9/30/2014Share this story on Facebook! While at IC Matt Wright interned for NBC at the Beijing Olympics, working alongside Bob Costas. He even got to work on site at the race where Michael Phelps earned his eighth gold medal. That story landed Wright a regional Emmy nomination. 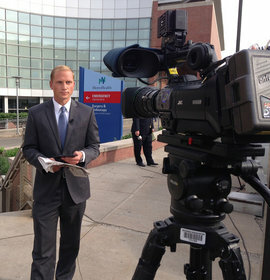 Wright now reports for Fox 8 News in Cleveland. One day he hopes to report for a major network, as Muir does.